Wichita has a many interesting and historically significant structures and architectural elements within its boundaries dating back to the late 1800's. Renowned architect, Frank Lloyd Wright, has two buildings in Wichita and a third designed for a family here, although not built, became the basis for other homes across the country. 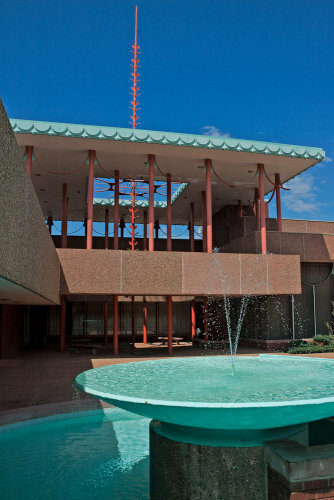 Architects Proudfoot and Bird designed many iconic Wichita buildings that are still in use today. Frank Lloyd Wright Architect - The most notable American name in architecture he created a unique style and constructed some of the more recognizable buildings in the country. Two of his designs can be viewed in Wichita. Allen-Lambe House - designed in 1915 and occupied by 1918, it's considered the last of the Prairie Houses and Wright himself commented that it was "one of my best." Twenty-three pieces of original furniture are also inside the house on display. Corbin Education Center at Wichita State University. Designed in 1957 and opened in 1963 it was one of Wrights last projects. He also designed desks, benches and other furniture still in use by students and faculty. Proudfoot and Bird Architects - While using their trademark Richardsonian Romanesque style of architecture, they designed a legacy of public and private buildings that are still being used today. Many of Wichita's icons were designed by Proudfood and Bird before the turn of the 20th century in the late 1800's. The John Mack Bridge was opened in 1931 and is the longest Marsh Arch Bridge in Kansas and the second longest in the country. Consisting of eight arches with a total length of eight hundred feet, it was the southern gateway into Wichita along highway 81. The Rainbow Bridge was saved from demolition and restored for another sixty years of service in 1997. The Minisa Bridge was constructed in 1932 and is decorated to match the façade of North High School on the east bank of the Arkansas River. This bridge is unique because of its Native American motif with buffalo, sunflowers and human forms. The Carthalite art work is made of concrete and crushed glass to give it brilliant colors. The Carthalite was made in Wichita and is a unique building element found in a hand full of structures in the city and one outside of Wichita.